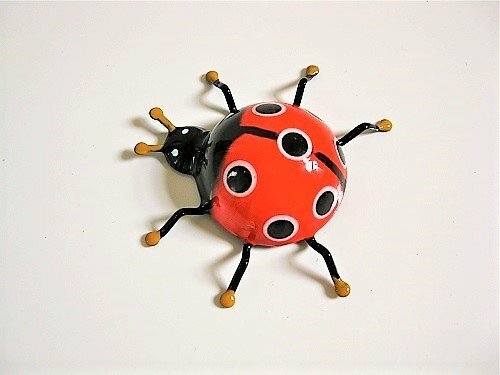 This vibrant hand-painted metal ladybird would make an ideal gift with significance for a friend or loved-one who needs luck for a special event. Ladybirds are regarded as symbols of good luck and many societies link the sight of a Ladybug with future happiness. They are firm favourites amongst children because youngsters are led to believe that if they make a wish with a Ladybird, their wish will come true. Dimensions: Mario, the lucky ladybird measures approx 6.5cms in length including the antennae and 7.2cms wide, and has a neat little magnet on the back for attaching to any metal surface. This ladybird fridge magnet makes an ideal good luck gift . . an sweet little present to wish someone good luck moving house into a new home, or for an exam, a driving test, a competition, an interview, etc. Comes gift-wrapped, like all our presents (with an information card) - and we can print a personal message on your behalf.